This chapter on progestin-only pills focuses on breastfeeding women. Women who are not breastfeeding also can use progestin-only pills. Guidance that differs for women who are not breastfeeding is noted. Take one pill every day. No breaks between packs. Safe for breastfeeding women and their babies. Progestin-only pills do not affect milk production. Add to the contraceptive effect of breastfeeding. Together, they provide effective pregnancy protection. Bleeding changes are common but not harmful. Typically, pills lengthen how long breastfeeding women have no monthly bleeding. For women having monthly bleeding, frequent or irregular bleeding is common. Pills that contain very low doses of a progestin like the natural hormone progesterone in a woman’s body. 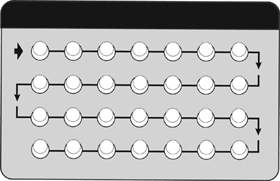 Progestin-only pills (POPs) are also called “minipills” and progestin-only oral contraceptives. Effectiveness depends on the user: For women who have monthly bleeding, risk of pregnancy is greatest if pills are taken late or missed completely. As commonly used, about 1 pregnancy per 100 women using POPs over the first year. This means that 99 of every 100 women will not become pregnant. When pills are taken every day, less than 1 pregnancy per 100 women using POPs over the first year (3 per 1,000 women). As commonly used, about 7 pregnancies per 100 women using POPs over the first year. This means that 93 of every 100 women will not become pregnant. When pills are taken every day at the same time, less than 1 pregnancy per 100 women using POPs over the first year (3 per 1,000 women).